Jam filled Sweet Rolls are called Buchteln in Germany. The Buchteln recipe is a yeast dough filled with jam and easy to prepare. Mix the flour, sugar, salt, and dry yeast in a bowl. Make a hole in the center to add the eggs. Once added, cover the eggs with the flour mix. Warm up the milk in the microwave to a lukewarm temperature and pour it over the flour mix. Melt the butter in the microwave and add it to the mix. With either your Kitchen Aid stand-alone mixer or your electric hand-held mixer, start working the dough with the kneading hooks. Keep kneading until the dough is smooth and shows some bubbles. Cover with a towel and let it rise until the dough has doubled in size. 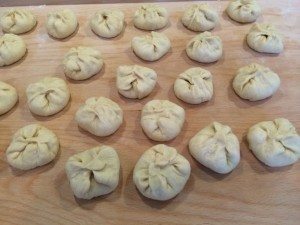 Roll the dough and divide it into 24 pieces. 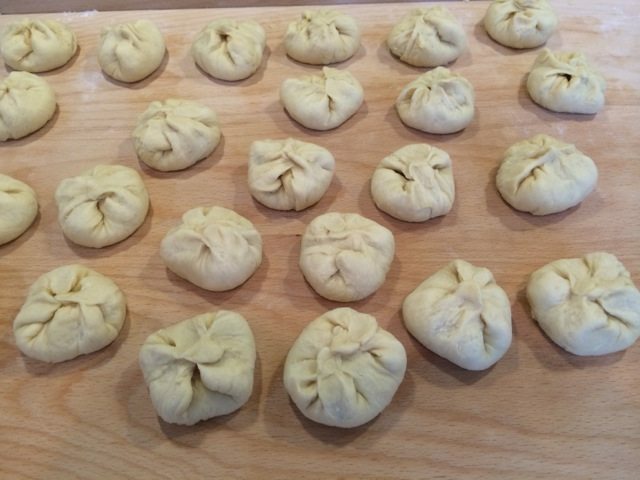 Form the pieces into balls, cover, and let them rise again for about 20 minutes. 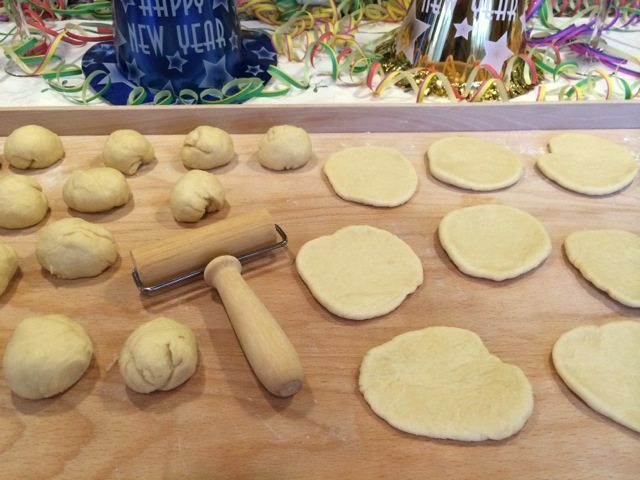 Use your rolling pin to carefully roll the balls into circles, starting from the center and working your way out. 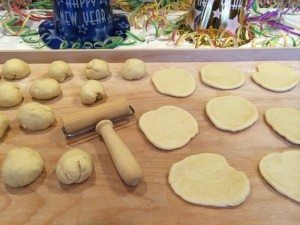 Alternatively, you can roll the dough and cut out circles with a cookie cutter or glass with a large opening. Cover the cutouts and let them rise for 20 minutes. 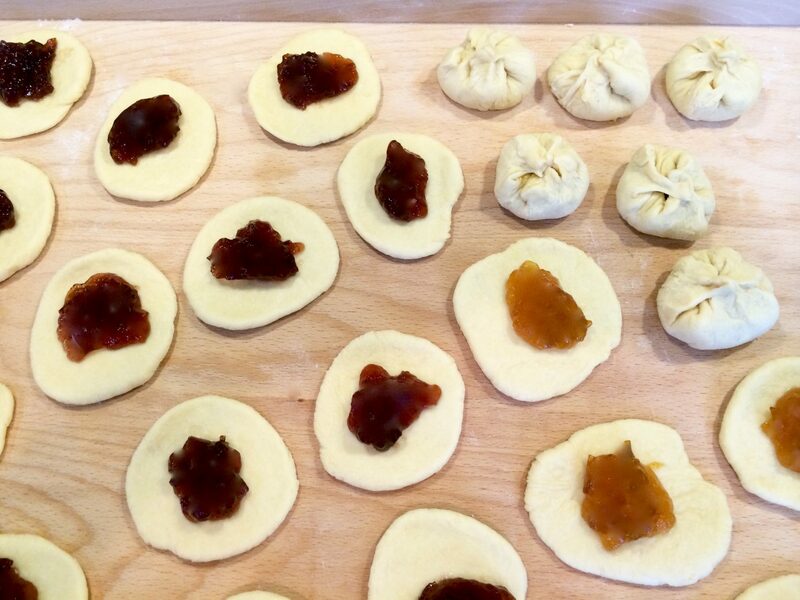 In the center of each circle, place a tablespoon of the jam or preserve of your choice. You can even create a variety, as I often do. Close each piece by folding the sides of the dough towards the center and sealing. Place all the pieces in a buttered casserole-type pan with the seams of the rolls facing down. Let them rise for another 20-30 minutes. Brush the Buchteln rolls with melted butter. Place them on the middle rack of your preheated oven and bake for about 30 minutes at 190°C (375°F). After 20 minutes, brush them again with some butter and return them to the oven for another 10 minutes. When ready, remove from oven and sift some powdered sugar on top. The Buchteln are best served warm. Enjoy! To try the Apple Pockets Recipe click here, the Bread Man Recipe click here, the Sweet Braided Bread click here, and the Easter Wreath Bread click here.